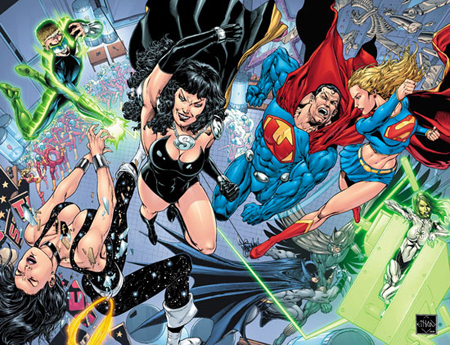 Justice League #1, by Geoff Johns & Jim Lee, DC Comics, $3.99, released August 31. There’s one thing I didn’t think of when I decided to review this comic. Nothing really happens in it. Before the last decade or so, it used to be that if you picked up a comic you’d get a complete story. Heroes could live a little of their civilian lives, fiendish crimes could be committed, heroes could meet, have a misunderstanding and fight a little, then team up, solve a mystery, fight the villain, lose, regroup, solve more puzzles, track him down, fight again and save the day—and that’s just the barest skeleton of what would happen in your most average twenty-odd pages. The saga might continue into the next issue, but each installment would provide a full story’s worth of derring-do along the way. Some writers still do that (and Johns isn’t one of them), but it’s by no means the norm anymore. Now the average adventure takes at least six issues to get through, and you’re lucky if you can finish one conversation in a single issue. The popular term for this trend is “decompression,” but that implies that comics used to be unnaturally compressed to begin with, which isn’t the case. They didn’t feel compressed, they felt packed–which is a similar concept but an entirely different connotation. Action-packed, packed with story–if there’s a state of nature for superhero comics, that’s what it’s always been, or used to be. The new ones aren’t “decompressed,” they’re sprawling, spread thinner and thinner, written for the trade collections and not for the single-issue reader. This is one of the many reasons I haven’t been a single-issue reader for a long time, although the primary reason is that individual issues cost too much. Not to sound ancient or anything, but when I started reading comics in the 1970s, one of those satisfyingly full comics was 35 cents. This one’s four bucks for what might generously be described as a quarter-issue’s worth of story. 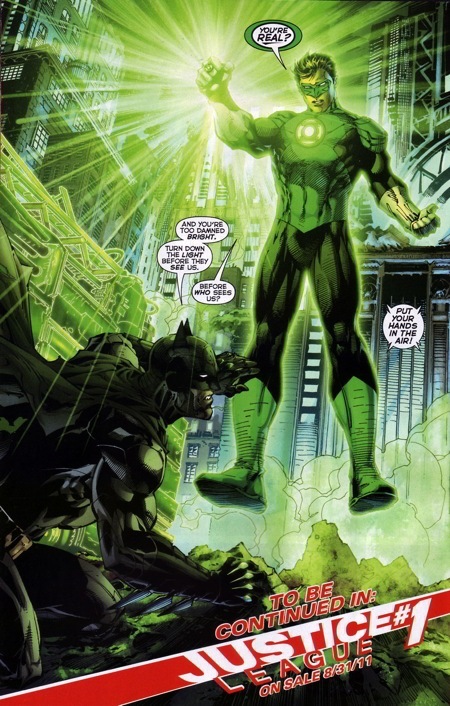 In the 24 pages of story in Geoff Johns and Jim Lee’s Justice League #1 (which are a sometimes hard to tell from the ad pages, which are all advertising the new comics of all the individual League members), Batman and Green Lantern meet for the first time fighting some random alien menace, then they’re off to meet this Superman they’ve heard so much about. That’s the whole issue. 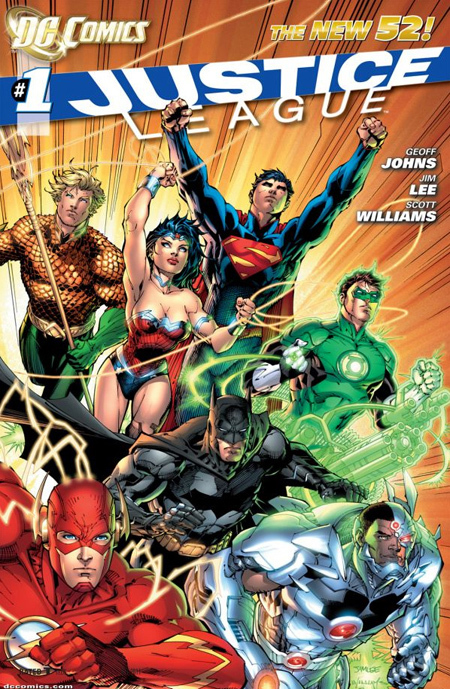 You see Flash, Aquaman and Wonder Woman on that cover? They don’t appear in this comic at all. Oh, and we see Cyborg there just living his life before he becomes Cyborg, not yet interacting with anybody else. It’s just teen athlete Vic Stone sad that his unseen scientist dad missed his triumphant football game. It’s unclear to me why Cyborg is even in this comic, because he’s never been in the Justice League before—he’s a Teen Titan, and one of the few who never did go on to become a League member—and now I guess he’s going to be a founding member? Perplexing. But then again, clearly this isn’t another retelling of the old story of how the Justice League of America came together—this Justice League can meet pretty much any way Johns wants them to. In any case, they’re a long way off from founding anything at the moment. Batman’s chasing some mysterious alien while being fired on by cops in helicopters, because all these new costumed weirdos look alike to them and superheroes aren’t really a part of their worldview. This isn’t a bad touch on Johns’s part, really, a natural consequence of the new status quo that this is a world that hasn’t really seen superheroes before. 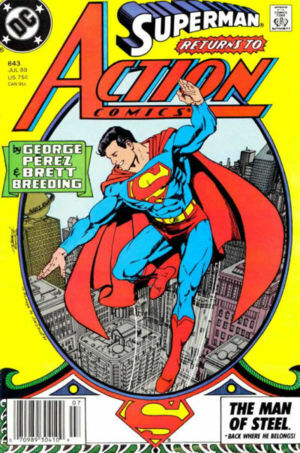 One thing that’s unclear is when all this is taking place, whether it’s the present day that most of the other titles take place in or, as I suspect, a “few years ago,” like Action Comics chronicling the days when Superman’s just starting out. That’s just about right, even if it does make Hal sound like a lunkhead. Which also is about right. Honestly, it’s not a bad question. 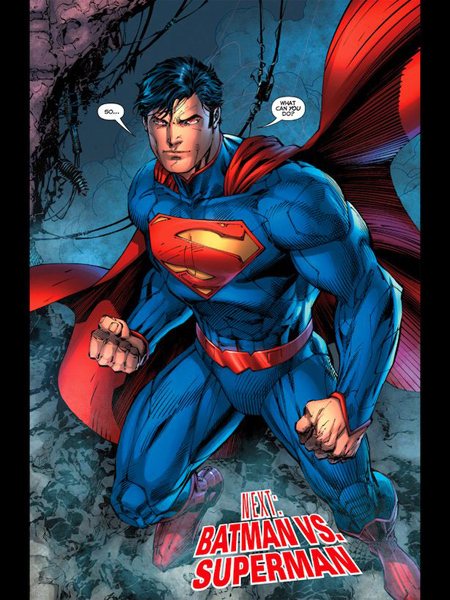 Their reasons for going after Superman seem pretty cockamamie and out of nowhere, and oddly rushed considering how little else happens in this issue. I guess that’ll happen when almost a third of the pages have less than 10 words apiece. As for the costumes, Green Lantern and Batman’s aren’t too bad, close enough to the originals that the changes don’t bother me much without really improving on them either. Lee seems to have decided that all the costumes are armor, so even though they still appear to be skintight, they also have faint grooves that I guess are where different sections of armoring meet, although they wind up looking like the costumes have had to be patched up a lot already. 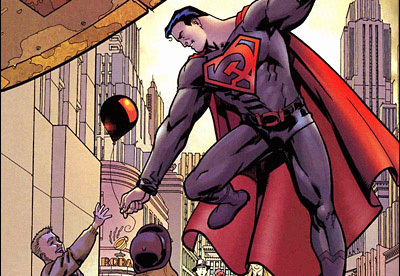 It’s a bird, it’s a plane, it’s… some guy in an off-brand Superman outfit. Superman’s costume I just don’t like. It’s not the loss of the red briefs (although all things considered I’d bring them back). 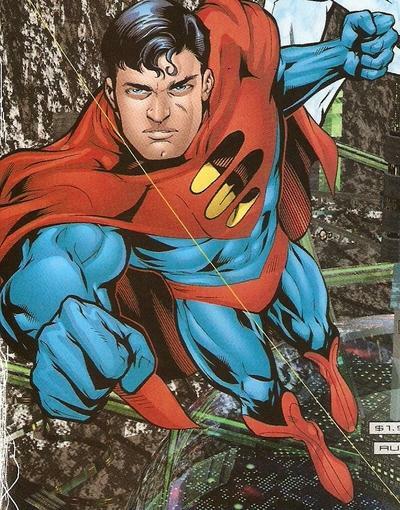 He just doesn’t look like Superman to me. he looks like a Superman—like one of the many alternate Supermen that we’ve met over the decades—but ultimately like an imitator, not the real deal. Too much blue above the chest emblem, which appears to protrude awkwardly. His belt, sleeves and boots are all shaped weirdly—Jim Lee does really like those V-shapes anywhere he can get them, not just by adding nehru collars to everyone’s costumes—and the lack of a spitcurl is a dealbreaker. And why does he need to be armored anyway? He’s Superman! Au contraire. THIS is Superman. Anyway, not much to go on here, really. 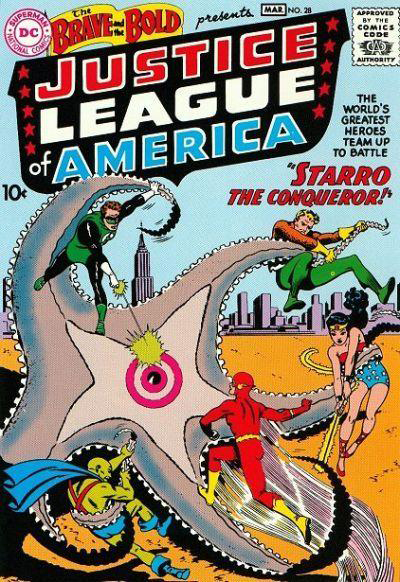 Say what you will about the villains the original Justice League assembled to fight—the mind-controlling giant space starfish Starro the Conqueror and a group of aliens that roughly corresponded to traditional earth “elements” (although if you say anything bad about Starro I will cut you, because he’s pretty much the best thing ever)—but at least those first stories were actual stories with a beginning, middle and an end. This one hasn’t even really begun. There’s more than a hint at the big villain of the story—which is very clear to the reader but nobody the heroes have ever heard of because they’re new in town—but there’s no real reason for the heroes even to hang out except professional curiosity. And I think that’s what LinkedIn is for—although I’m just guessing because I haven’t really found a practical application for it yet. That said, the issue reads like a decent first three pages of a story, dragged out to 22 pages. This Justice League series may not be much of anything yet, but it’s not an embarrassment, and with DC’s recent track record that qualifies as a decent start. Or something that might get around to almost starting after a few more issues of slowly meeting the Tin Man, the Cowardly Lion, et cetera. 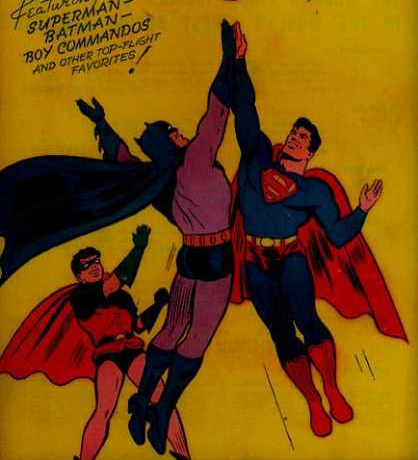 Or, you know, they could just waste our time by having Batman fight Superman again—for the first time! Ah, I guess that is what we’re doing next. Well, that’s always nice. Next issue: Batman wins! And then at least four pages of high fives.